What Does It Take To Be Rosie the Riveter? 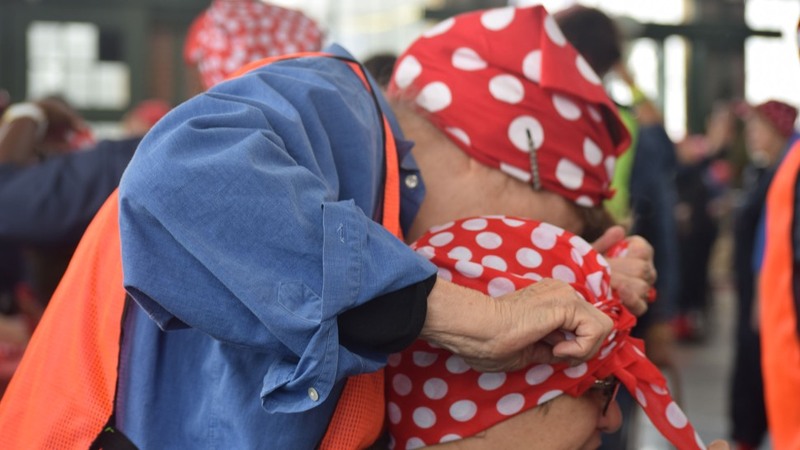 On Saturday, organizers had hoped that the massive turnout would best last year's Guinness World Record for "Largest Gathering of People Dressed as Rosie the Riveter," which the Richmond group snagged in 2016 with 2,229 attendees. Though they fell short of beating their own record, the mood was still celebratory as Rosie lookalikes danced and jived to classic songs from the 1940s and 1950s. Attendees and organizers said it wasn't about winning a title; it was about paying tribute to women whose role in the war effort is often marginalized. The story is well-worn, but it bears repeating, said Berman. When the men returned home from war, some of the Rosies refused to return to their cloistered domesticated spheres. It was too late; the trailblazers had already been allowed to actualize their economic power, and there was no turning back. Many of the 16 million women would go on to enmesh themselves in other career tracks, tenaciously braving explicit workplace sexism from men who thought they ought to go home. "It was the start of something big," explained Ardel Robinson, speaking of the Rosies with unmistakable reverence. "They wanted to keep working....What they did helped make it more acceptable to society." Most of the original Rosies are now in their eighties and nineties. When a group of them walked to seats near the front of a makeshift stage at the Craneway Pavilion, women young and old reached out to shake their hands. "The funny thing is, if you ask the Rosies who are still with us, they don't realize how special — how truly groundbreaking — what they did was," said attendee Carla Raspuccio, whose mother was a factory worker during the war. "They did it because they had to. They weren't trying to make a statement, but their success paved the way for working women all over the the U.S."